Stroke is the third leading cause of death in Western countries. Prediction of the potential growth of a cerebral infarct during the first hours of ischemic stroke (AIC) is a crucial issue to reduce mortality and limit consequences as invalidity and neuro psychological disorders. Around the irreversible lesions, ischemia is more moderate and leads to synaptic dysfunction leading to electrical silence, this anomaly has been called “ischemic penumbra”, since it is reversible if ischemia is quickly reduced. Otherwise, the penumbra may evolve into infarction, according to ischemia severity. The existing MRI techniques are relatively complex to implement and require contrast intravenous injection. This is no longer usefull with NeurInfarct based only on conventional MRI sequences. NeurInfarct is based on image processing of apparent diffusion coefficient (ADC) maps directly derived from the initial sequence of diffusion (DWI). These images measure the mobility of water molecules which is reduced in the fixed area of infarction, but is also slightly disturbed in the penumbra. These recent changes are too thin to appear on these images. NeurInfarct will quantify these changes automatically in order to simulate the real growth of the brain infarction. The principle is to define the brain infarct core which appears as a high white signal (red zone) on the right image (diffusion-weighted image, DWI). The ischemic heart is characterized by a significant decrease of ADC (left image). On this map is reported the previously defined area which will serve as a seed base for the prediction of growth potential (yellow circled area). The results of the clinical study conducted on 98 patients, jointly with the stroke center of “la Pitié-Salpêtrière” in Paris are published in Radiology 2009 by Rosso et al, . These results indicate that the performance obtained by NeurInfarct are at least as good as those of existing MRI techniques require the injection of intravenous contrast. Moreover, the results are standardized because the method is almost entirely automatic, which is an advantage in the stroke clinical context. 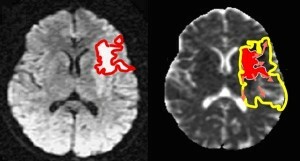 On the left, diffusion-weighted image: the infarct appears as a hyperintense white signal (red outline). This area must be defined to serve as a seed base for the prediction of growth potential. On the right the final size of the infarction (outlined in yellow) predicted by NeurInfarct from the apparent coefficient (ADC) maps of water molecules diffusions. Video of the infarct growth potential : we can see in yellow the initial lesion, in red the area predicted by Neurinfarct from the apparent coefficient (ADC) maps. accumsan mattis commodo felis in sit eget ut id risus elit. leo.